I am absolutely loving autumn this year. I have been fortunate to get a whole tub load of quinces from my mum and dad from their orchard so have been going nuts making all things quince! Mum and dad have built a beautiful free-range chook run around their trees and the result is wonderful organic fruit trees that are completely coddle moth free, as the chooks gobble up the coddle grubs before they can reach the fruit in those vital winter months. I love the principles of permaculture and how our marvellous feathered friends are so vital in our journey for chemical free. One of my absolute favourite uses for quinces is to make quince paste. Once you make your own, you will never go back to the store bought stuff (even the posh stuff), and it pretty much keeps indefinitely in the fridge, in a jar on the shelf, or do as my mum does, she freezes it (I love her love affair with her deep freeze – such a marvellous modern invention!). My quince paste is pretty much pure quince, sugar and a little lemon – that’s it! Nothing else added, NADA! ZILCH! Just the good stuff! Every year, Mum and I make this quince paste. This recipe is fail-safe and tastes incredible. We do finish it off differently—Mum dehydrates hers, while I just pop mine into sterilised jars after cooking it in the saucepan (quicker and just as good in my opinion). I will give you both endings—it’s a choose your own adventure. Preheat oven to about 150°C (300°F). Bake quinces whole, with skin on, in a baking dish for approximately 2 hours until soft when pierced with a skewer. Remove and cool. 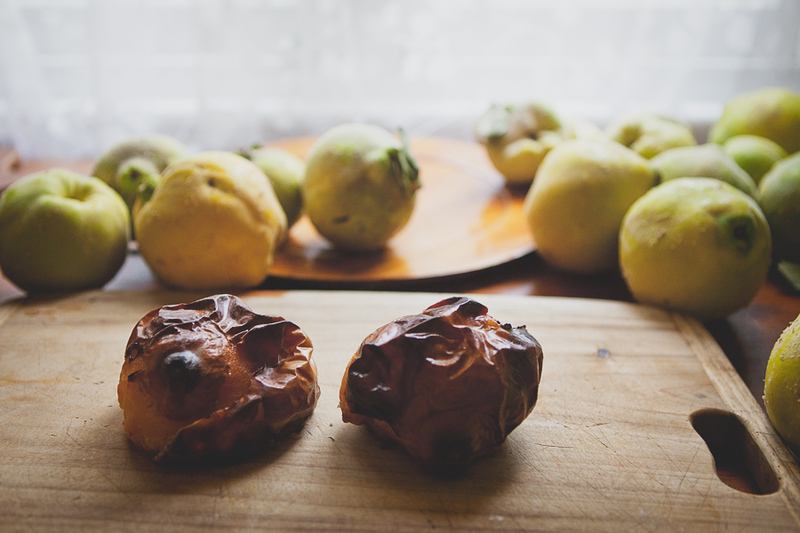 When cool, peel and cut quinces into quarters, removing seeds. On a side note, I also love baked quinces, drizzled with honey and a big dollop of yoghurt on the side for a yummy dessert! Weigh the flesh and weigh out an equal amount of white sugar. Puree the flesh in a food processor (you may need to add a small amount of water to puree as it could be quite thick) and then rub puree through a sieve. heat for two hours, stirring occasionally with a wooden spoon. Towards the end the paste will really thicken up and leave the sides of the saucepan when you are stirring. Pour the hot mixture into warm sterilised jars and screw the lid on tightly. Keep in a cool place. Once opened, keep in the refrigerator. This will keep for over a year in the fridge – I have a massive jar still going strong (I think I need to eat more cheese). 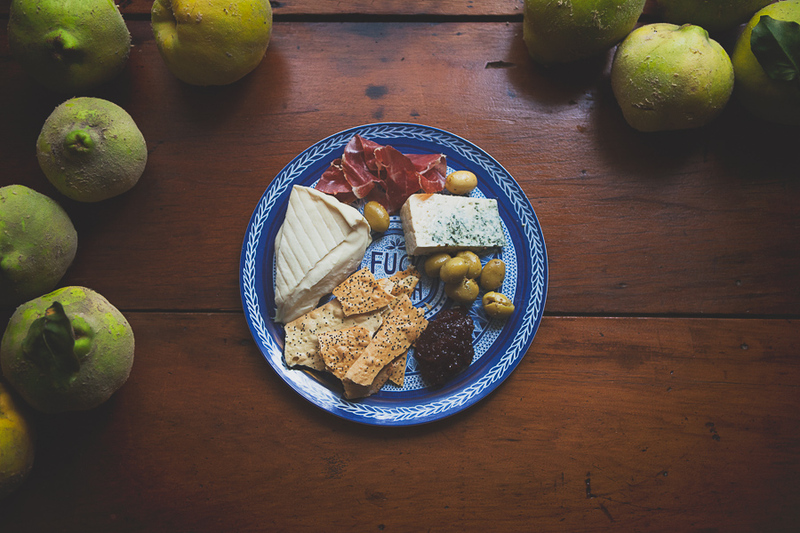 It is a bit ‘jammier’ than the option below, so I just spoon out dollops onto the cheese plate. Spread mixture thinly and evenly (no more than 5 mm thick) in a shallow tray lined with baking paper and dry the paste in a 50°C (120°F) oven overnight. Cut the paste into small squares and dust with caster sugar. Store between sheets of baking paper in an airtight container in the refrigerator. Do as Rosie does, pop it in the freezer until needed – although I found a container up the back of my fridge and it was well over a year old – so it it fine in the fridge too!! This paste is fabulous with cheese and wine. It also makes an amazing glaze dredged over pork or turkey.